For the hundreds of lower league and non-league clubs without a hope of getting to the FA Cup final, the third round draw is what it’s all about. The 40 clubs contesting the second round will all harbour dreams of landing the glory and the cash of a tie with a big club. 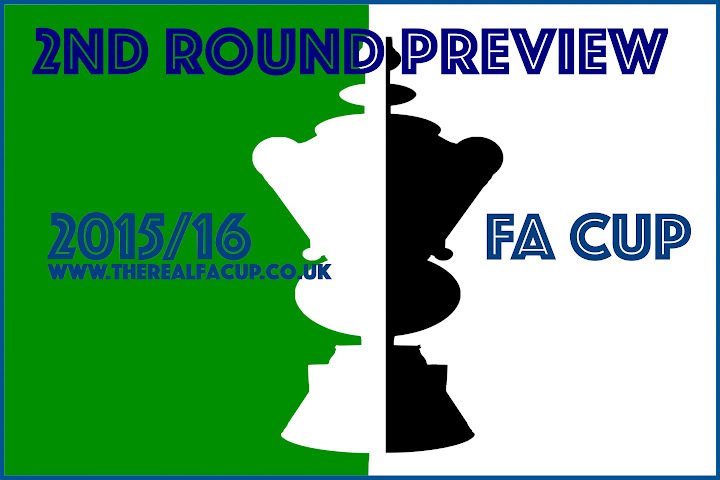 Such is the significance of the third round of the FA Cup that the draw itself is long established as one of sport’s great occasions. 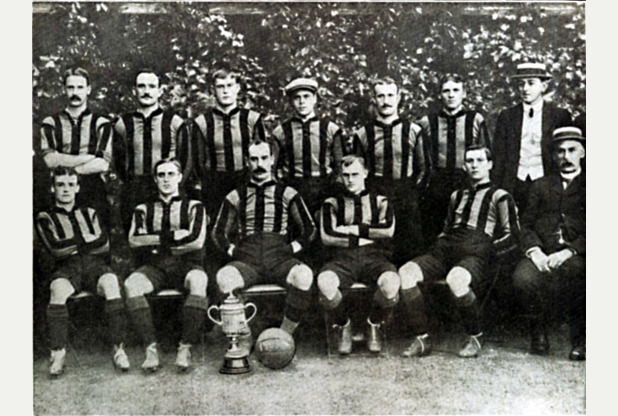 Hull’s distant history as the hometown of one of the founders of the Football Association, coupled with the more recent achievement of Hull City in reaching the final in 2014, combined to bring it the hosting rights last season. That’s a big deal given that no one present on the day or quoted in the advance publicity could come up with an example of the draw ever having taken place outside London. It was certainly a must-see for the hundreds of people who chased tickets to attend the BBC’s live coverage of the event, and it was a genuine thrill for your correspondent who well remembers taking a pocket radio to school in the days when the draw was always on a Monday lunchtime. I’d been before, late in 2007, when I walked into the FA’s headquarters at Soho Square just as Trevor Brooking went through the rehearsal and gave Hull City a trip to Oldham Athletic. I suggested he might come up with something a bit more exciting in the live draw, so he paired the Tigers with Plymouth Argyle. Away. We lost. But this time it was on home ground and – even better – at the home of one of my PR clients. 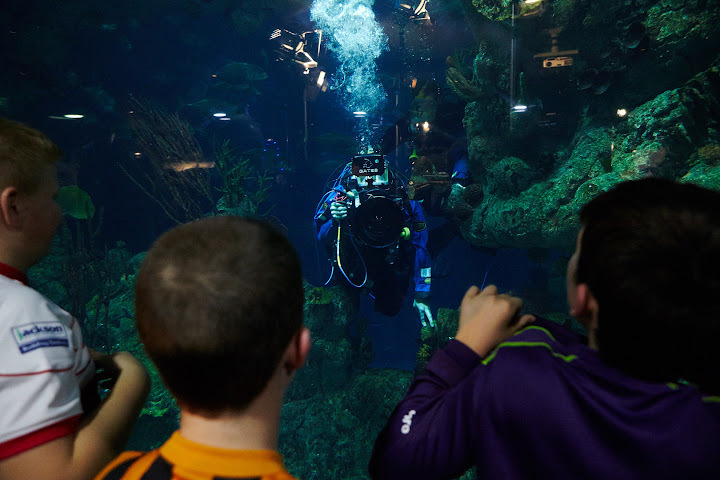 The Deep – a serial winner of tourism awards and one of the most successful of the projects built to mark the millennium – had hosted the Olympic Torch Relay and the Queen’s Baton Relay for the Commonwealth Games. In the absence of any memorial to Ebenezer Cobb Morley, born in Hull and credited with having drafted the first laws of football, the aquarium got the nod. It helped, of course, that the surroundings, alongside a huge tank full of exotic aquatic creatures, were perfect for all those quips about big fish and minnows. The activity behind the scenes was fascinating enough. 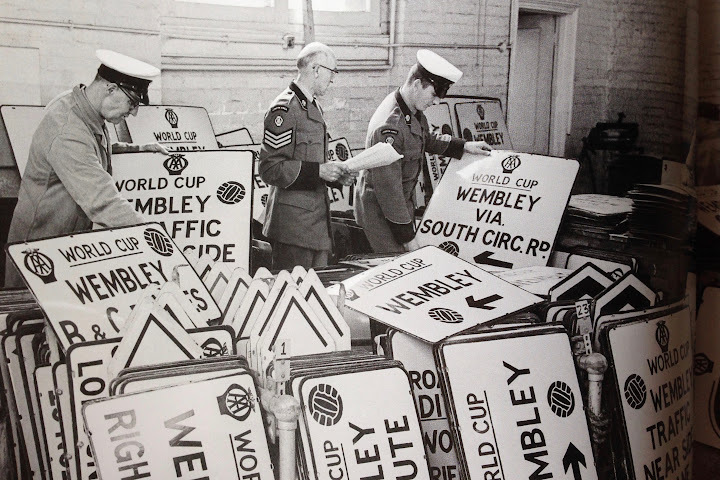 Weeks before the event crews, cameras and football fraternity descended on The Deep, whose staff were in close consultation with the FA and the BBC. They walked every inch of The Deep that isn’t underwater, and some of the parts that are. They had to work out where to build the live set, where to host the audience until show time, where to settle the VIPs, how to manage the growing media interest. On the day, satellite vans lined the banks of the Humber, linking the aquarium’s main gallery with the millions of TV viewers via thousands of metres of cables. The attraction closed to the public in the afternoon. The studio audience assembled in a viewing area overlooking the river and the VIPs gathered in The Deep’s restaurant. The live TV audience in the UK alone was calculated at four million. More tuned in from around the world. 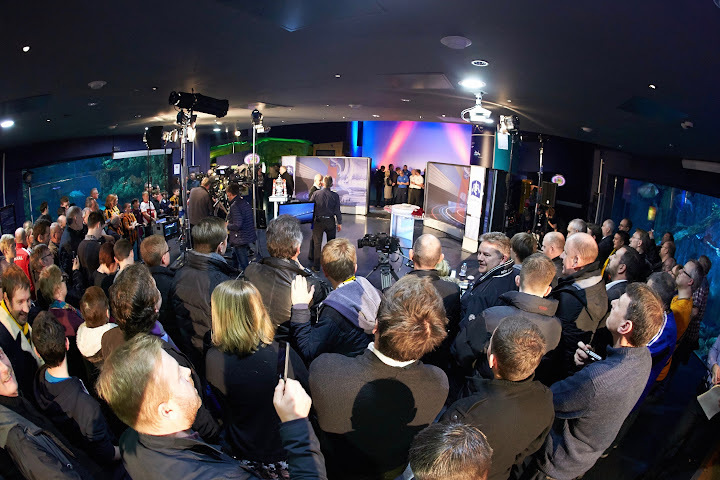 There were around 150 studio guests who applied via the BBC’s website and turned up to provide a boisterous studio audience, plus another 50 or more from the TV production team, media and celebrity guests. Local interest was huge. City’s appearance in the 2014 final was their first and they nearly pulled off one of the biggest shocks in the tournament’s history. They raced into a 2–0 lead after only eight minutes but couldn’t sustain their efforts, losing 3–2 against Arsenal but winning many friends and taking the name of Hull to football fans worldwide. 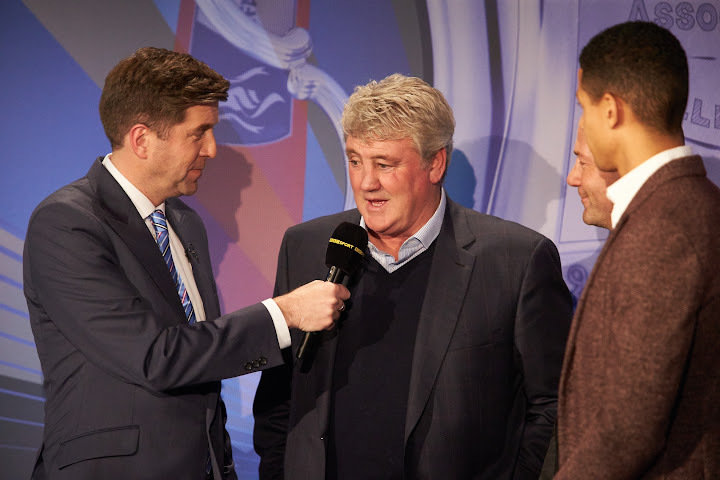 Manager Steve Bruce and team captain Curtis Davies, scorer of City’s second goal at Wembley, were among the guests for the draw. 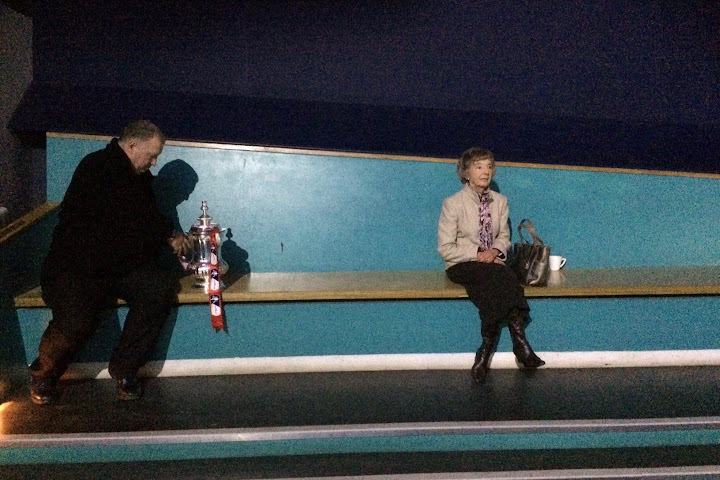 Even the rehearsal delivered high drama, giving City a home tie against Arsenal. Remarkable, and a relief to Bruce who, while awaiting the proper draw, told Alan Shearer how pleased he was that the pairing only came out in the practice run. 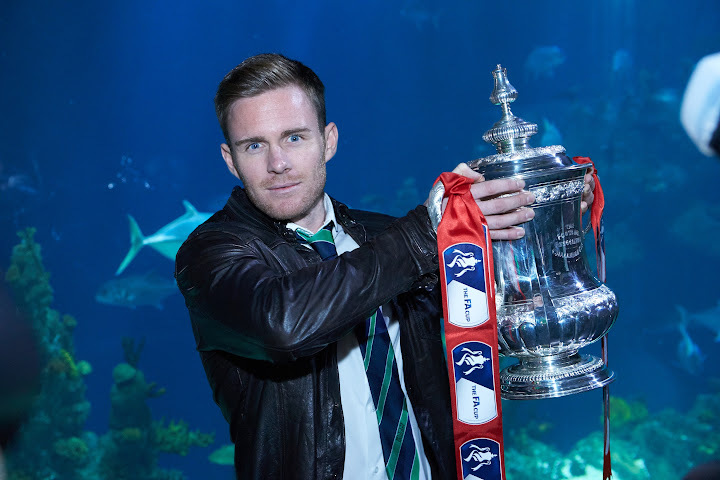 Seven TV cameras – plus one operated by a diver in the tank – and even more lights showed the FA Cup in all its glory and captured the excitement of the studio audience as the live show began with shots of The Deep, the Humber, the sights of Hull and the images of City’s historic day at Wembley. Most of the fans wore the black and amber. One had Arsenal on his jacket. They all gasped in disbelief as the actual draw paired their teams together yet again! Arsenal at home, drawn out by Paul Adamson, a grassroots coach with the East Riding County FA, would play Hull City, whose ball was pulled out of the goldfish bowl-style receptacle by Shearer. 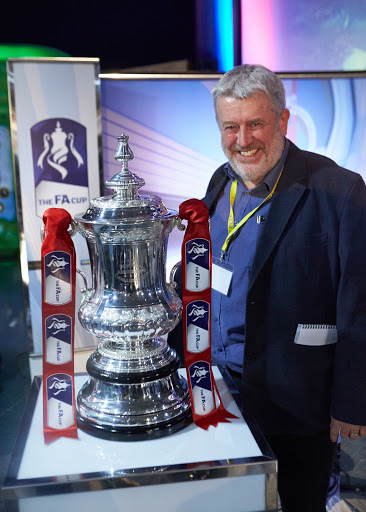 Presenter Mark Chapman, a University of Hull graduate, restored some calm and the draw continued, matching AFC Wimbledon with Liverpool in a repeat of the 1988 FA Cup final, and then the 1973 finalists Sunderland and Leeds United. Every fixture brought an ooh or an aah from the crowd. Blyth Spartans sent a couple of representatives along to celebrate their second round win over Hartlepool United and ponder the reward of a home tie against Birmingham City. Southport boss and former Hull City player Gary Brabin received a warm welcome and a trip to Derby County. Bruce looked shell-shocked, and why not? This was the first time since Spurs and Burnley in January 1963 – and only the second time in history – that the previous year’s finalists had been drawn together for their opening match of the following season’s FA Cup campaign. 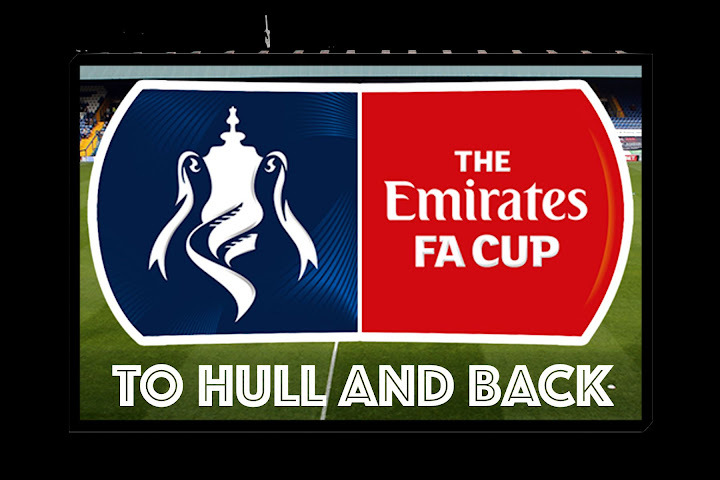 Time stood still as Hull City fans in the audience looked at each other as if awaiting the FA Cup draw equivalent of goal-line technology. Something must be wrong. Shearer has discovered a sense of humour. It’ll be all right in a minute and we’ll be at home against Barnsley. A year on it still feels weird. And after the expected defeat at Arsenal the feeling is one of unfinished business. Along with supporters of all the other clubs in this year’s draw we’ll be watching closely. We don’t know where it is, when it is or who we want. Anybody but Arsenal. Words: Phil Ascough. Phil is an author and regular on these pages. Pictures: Karl Andre Smit. Karl is a professional photographer, see more of his work here. 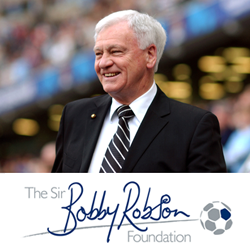 Hull City back in the premiership now – what about that then? Must be excited for the season to start. Bit mixed really. The Championship is great but I guess everyone wants to be at the highest level they can reach even if it means experiencing the worst excesses that the game can throw at you. Biggest concern remains the owners. Reports suggest they have set a deadline of Monday for bids from people who want to buy the club. I’m told a sale is definitely imminent. However our owners are notoriously difficult to deal with. And of course it’s possible that the new owners would be no better. If the sale doesn’t go through expect the current owners to persist with the Hull City Tigers nonsense. That’s what it says on the tickets for the friendly at North Ferriby United next week. And if they don’t sell then expect more protests and declining ticket sales, even for the Premier League.